Miles, the world’s first universal miles earnings program that lets anyone with a smartphone rack up reward points for things that don’t involve flying or using a credit card, is ready to take over the world. The company, founded by Jigar Shah, Paresh Jain, and Parin Shah, is announcing a new series of product enhancements, new rewards partners with major brands, cities, and transportation providers, and strategic investments by JetBlue Technology Ventures, Porsche Digital, and Sony Innovation Fund. If you don’t know the app, which is available to download for free on iOS and Android devices, Miles basically encourages alternative, sustainable modes of transportation–a must for anyone who cares about the fate of the planet. It does that by rewarding users who take the train, subway, bus, boat, bicycle, or make their way on foot, with exclusive rewards from brands across a variety of categories. Think Audible or Postmates credit or Starbucks gift cards, earned for biking to work instead of driving. The more sustainable the mode of transportation, the bigger the reward–so those who take Uber earn 2x miles, while those who ride a bike receive 5x miles. Since its initial launch last July, Miles has been a hit, and users have earned more than 270 million miles, redeeming approximately 40,000 rewards, with an average value of $20 per reward. The innovative idea has been such a success that now other people want in on the action, and Miles has new strategic investments totaling more than $5.75 million. New investors include Porsche Digital, Sony Innovation Fund, SAIC, China’s leading automotive manufacturer, and JetBlue Technology Ventures. “Sony Innovation Fund has been looking to broaden its mobility-related portfolio, and our investment in Miles is a great way to do that,” says Toshimoto Mitomo, a senior investment executive at the Sony Innovation Fund. The company is making itself even more enticing to users with its expanding roster of reward partners, including Ray-Ban, Getaroom, Getaround, Harry’s, Home Chef, Illys, Oakley, Saucy, Shipt, Rhone, Rockport, TOMS, Thrive Market, and Vudu, among others. That’s in addition to rewards from Amazon, Starbucks, Target, Cole Haan, and many more. The partners can leverage Miles’s predictive AI platform to help their customers meet their imminent needs, serving up options when someone needs a meal or a ride, leading to increased customer loyalty, repeat visits, and increased sales. 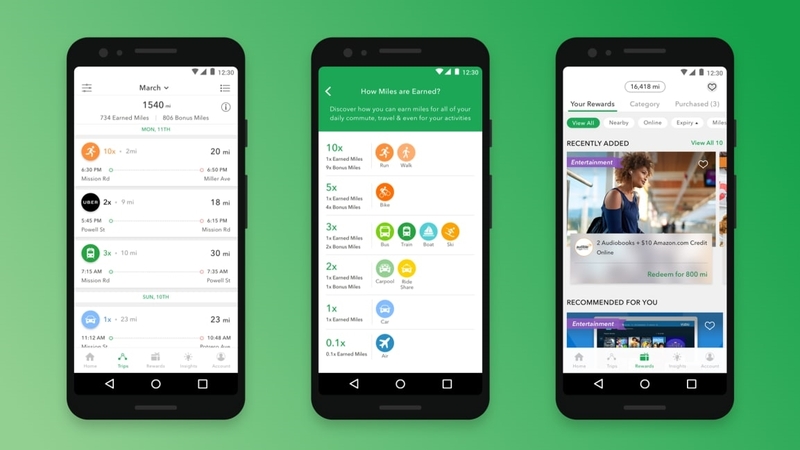 “The wide variety of rewards available through the Miles app, coupled with the novel approach to earning them, puts Miles’s program in a position to revamp customer loyalty,” says Bonny Simi, president of JetBlue Technology Ventures. Revamping customer loyalty isn’t the company’s only mission, of course. In addition to working to promote their app within the travel sector, Miles is also working to promote greener travel by teaming up with cities like Sacramento and agencies like the Contra Costa Transportation Authority to offer bonus miles and rewards to promote greener travel by rewarding users who choose public transit or stay off highways during commute time. It’s a worthy goal and appeals to users’ desire to help the planet, even if doing the right thing requires a little nudging and the allure of free Postmates.